How were your mid-autumn celebrations this year? Hope everybody had fun! We got to make mooncakes at the St Regis Singapore, and we thoroughly enjoyed it. 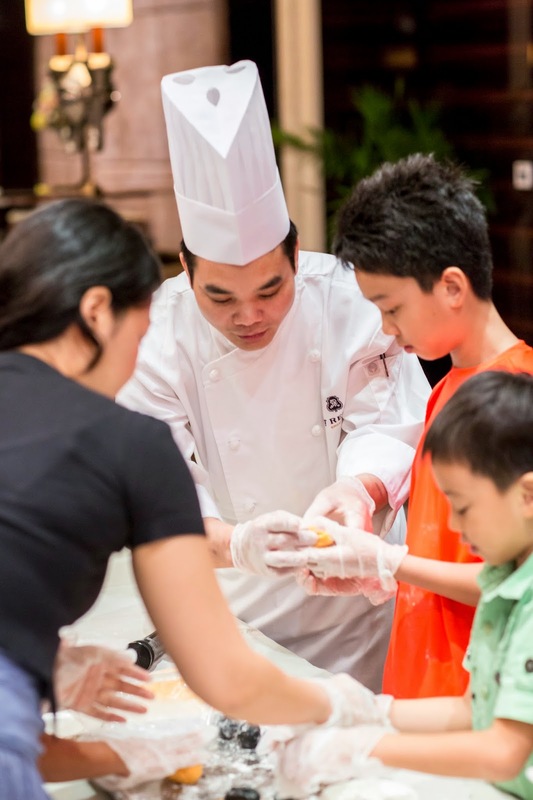 The St. Regis Singapore invited business partners and their families for A Cherished Mid-Autumn Fete, A Family Traditions at St. Regis Festivity. It was a family-oriented mooncake-making charity event on 30th August 2014. With the aim of giving back to society during the Mid-Autumn Festival, The St. Regis Singapore made contributions to international aid organisation, UNICEF, Check Out for Children (COFC), a Starwood Hotels & Resorts’ adopted charity, as well as to more than 250 elderly at local beneficiary NTUC Eldercare Co-op Limited. They raised a total of S$3,800 for COFC from the event, which was sponsored by business partners. Their families participated together with associates of the St Regis Singapore. The Mid-Autumn Fete is one of the many projects that the St Regis Singapore has established to add to the Starwood Group's global efforts to benefit more than 9.3 million children in over 190 countries that are part of the COFC. More than 500 pieces of mooncakes and other charitable gifts were donated to more than 250 elderly at one of the NTUC Eldercare Senior Activity Centres. The associates also joined the seniors for entertaining activities and games. By the way, families that stay at the St Regis can enjoy welcome amenities and turndown rituals designed to showcase the uniqueness of Singapore: delectable treats, strollers, baby wipes, diapers, cribs and rollaway beds on request. It's part of the Family Traditions programme. Guests below 13 receive a welcome gift bag that includes gifts like coloring books, board games, story books, caps at time of check-in. Here are some of the event photos of me and my girls. We had such fun making snowskin mooncakes for the first time. Somehow we managed to eke out 31 mooncakes! Obviously only fit for self-consumption, and not gifting! LEGOLAND Malaysia Launches Star Wars Miniland!